Renting a cottage 6 people, a cottage 4 people, 3 trailers for 4 people each and a family suite for 4. Possibility of additional beds (on request). Curists rental. Group rental minimum 2 nights. access to 10 minutes of the Antilles of Jonzac and the baths. possibility to rent each accommodation individually for 1 night minimum outside of July and August. All our accommodations are heated and have their own toilet and bathroom. Group rental: total capacity 26 people. Welcome to the Roses of Jonzac. 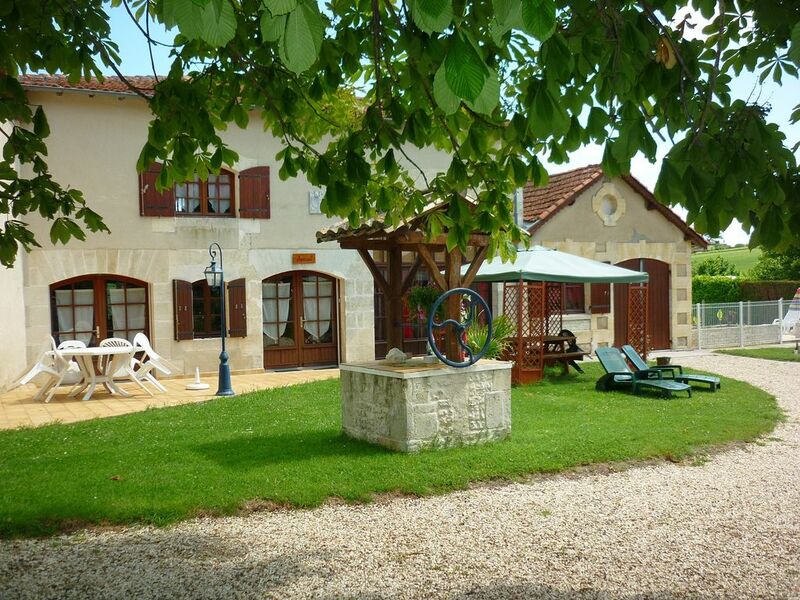 Let yourself be tempted by the scenery, in the beautiful countryside of Charente Maritime, quiet and 10 minutes from Jonzac, its aquatic complex of the Caribbean, its leisure base in the summer and spa. In the middle of vineyards and sunflower fields, we offer 3 unusual accommodations in the form of trailers for 4 people each (2 adults + 2 children or 3 adults), a 2 star cottage for 4 people (2 adults + 2 children or 3 adults), a 3-star cottage for 6 people (2 to 4 adults and 2 children) and a family room (for 4). That is a capacity of 26 people. Possibility of additional extra beds. For your family or professional parties and meetings we offer a reception room that can accommodate 30 guests sitting or 60 standing. Relaxation is assured in our large garden or by the pool. Everyone can gather to eat in the reception room adjoining the cottage 6 people, or outside thanks to the many tables available. Sheets are provided for rentals of 5 nights or less. We also offer spa packages from € 500 to € 750 excluding July and August. In each trailer you will find a sleeping area with a bed 140 cm, a sitting area with sofa bed, television, kitchenette, dining area, bathroom with spa shower and toilet. Heating. Tables and barbecues are available to take meals outside. Our cottage of 70 m² is composed of a mezzanine bedroom with a bed 140 cm, 2 bunk beds on the large landing, and a living room with 1 sofa bed, flat screen TV of 81 cm with TNT. Kitchen with fridge-freezer, 4 hotplates, dishwasher and micro-wave, electric oven. . 1 bathroom with toilet and balneo shower. WIRELESS. Terrace with pergola, tables and chairs for outdoor dining. barbecue available too. Description of the cottage for 4 people of 30m2. It consists of a living room with fitted kitchen area, a table and chairs for meals, a sofa bed, and a TV. The room is composed of a bed 2 pers and can accommodate an umbrella bed. The bathroom is composed of a shower, a washbasin and a toilet. The family suite consists of a bedroom with a double bed (140cm) and wardrobe, a bathroom (shower, sink and toilet) and a living-dining room with a trundle bed convertible into 2 single beds 90 cm ) or a large double bed (180 cm). Accessible to all on the property: swimming pool with terrace and deckchairs, outdoor games for children and adults (trampoline, ping pong table, wooden games) on a large plot of 4000 m2. Finally you will enjoy a view of the countryside, mill and vineyards. We are close to hiking trails. 10 minutes from Jonzac and its "West Indies" (large aquatic complex with wave pool, tobbogan and river current, fitness area with jaccuzi. ), Its casino, its leisure base and its famous baths. bathroom + washbasin + wc in each housing. the 5 accommodations include a kitchenette or kitchen equipped with small appliances (toaster, kettle, coffee maker, microwave, hotplates and hood). The guest room has a small fridge, a microwave and a kettle. In addition in the cottage 6 pers: a dishwasher, a Nespresso machine and an oven. In addition in the cottage 4 pers: a combined oven microwave. Gift idea for Mother's Day, weekend getaway, gift vouchers, rental unusual, group rental, spa rental. Nous avons beaucoup apprécié ce séjour en roulotte, atypique et charmant. Notre fille de 5 ans a adoré aussi, notamment l'espace jeu avec le trampoline. La roulotte est très bien aménagée, fonctionnelle et toute mignonne! Très bon accueil également! Beaucoup de visites à faire aux alentours. Nous vous remercions beaucoup pour votre appréciation. Au plaisir de vous accueillir. Des vacances dépaysantes et très chouettes, dans une roulotte très agréable et bien aménagée (un couple et un enfant), bien entretenue. L'accueil a été très chaleureux et la propriétaire nous a conseillé sur les visites à faire dans le coin, très intéressant à découvrir. Nous sommes ravis et notre fille a adoré le trampoline! Nous vous remercions pour votre appréciation. A bientôt. Valérie et Philippe. Les avant dernière c'était au Maroc haha!!!! Oui pas de WIFI dans la roulotte mais possibilité de se connecter à Internet dans la roulotte à l'aide du forfait mobile Internet. Espace WIFI gratuit à l'extérieur. Nous avons vraiment aimé l'endroit, reposant et avec aux alentours beaucoup de choses à visiter, pour nous nous recherchions un lieu pas très loin de chez nous, et nous avons trouvé, pas de regret car nous avons reçu un accueille très chaleureux. Nous vous remercions pour votre appréciation. On espère à bientôt.